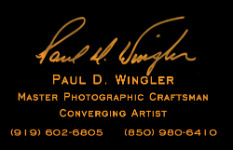 Award Winning Portrait and Fine Art Converging Artist Paul Wingler merges the fine arts and storytelling to define his signature or style of work. His passion for creating fine art and telling stories through his imagery didn't stop when the digital age came into play, but rather was another journey to merge the old with the new and still maintain his style of work. As Mr. Wingler continued to define his art, he found it more as a converging art through his use of substrates (materials), old masters concepts and digital technologies. It began to shape a new style - a new era of his art. Paul continues to create "traditional" style portraits for families, as well as continuing his own unique style of art.